The Lockheed Samurai single-wing helicopter drone is a micro-air vehicle (MAV) that consists of a single wing that spins around a hub. 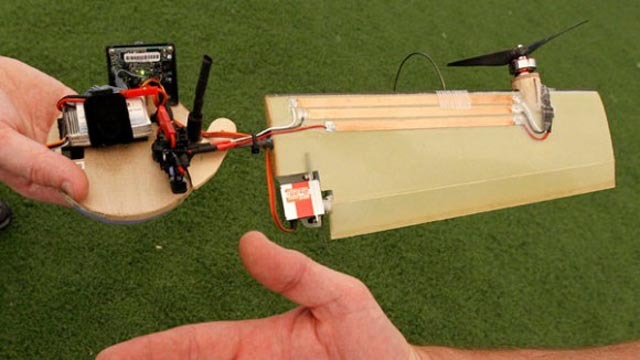 The idea behind Lockheed's new Samurai drone is to mimic the motion of the helicopterish maple seeds we amused ourselves with as kids to create a simple flying mechanism. The stripped down design lets the drone operate with just two moving parts, and come in at about a foot long. It's a prototype for now, but when it makes it to the field it'll be operated by remote control, and will be carried into the field in a lightweight backpack. and the Bee Cam from Karen Traviss' 2004 novel City of Pearl. Via North Jersey and Gizmodo.